Saturday night, on a complete whim, I decided to bleach and dye my hair. My bathroom cupboard is packed full of hair dye in just about every color I could ever want so I just waited to see how light my hair bleached to before deciding what I wanted to dye it. Oddly enough the purple and pink bleached right out. Normally they’re two colors I have problems getting out of my hair but I was literally watching it disappear before my eyes as I applied the bleach. I still had some residual blue left. I’m opposed to going back to blue for a little while though. I still want to play around with new colors and combinations before settling down with a color again. I’m just glad I decided to do this way after St. Patrick’s Day. I’ve found that someone will always ask if your hair color correlates with whatever holiday is closest. When I was in the ER at the beginning of the year with a concussion the nurse and doctor both (at separate times) asked if my blue hair was “for the new year”. Um, no? Pink hair for Valentines. Orange for Halloween. Pastels for Easter. Purple for The Grape Jamboree (it’s a local thing). These are all things I try to avoid. You can find all my tips on bleaching, dying and maintaining colorful hair here. Wow, I love it so much, it looks great! I don't think so. I've never had completely yellow hair but I have had yellow mixed in. Also, I've never had vibrant red hair, only natural-ish red. LOVE LOVE LOVE. 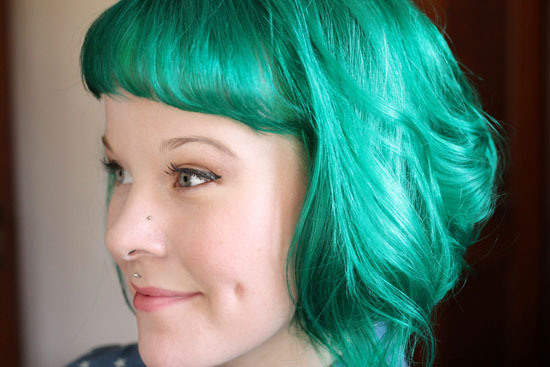 I can't wait to dye my hair soon, this color is on my list. Love it! Green is a great color for you. 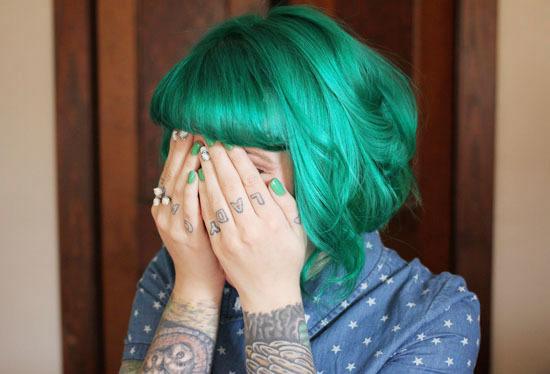 I've always said as soon as I land my dream job (self employment) or go on maternity leave I am dying my hair jade green. I love it! But fear my banking bosses wouldnt look upon it with the same lust I do! OH MY GOODNESS! This is my favorite color yet! Gorgeous!!! Such a gorgeous colour, I'm always amazed how good condition your hair looks in considering you bleach it so often! I really don't bleach my hair that often. Once every few months? OOo! Pretty! I wish I could do this!! Alas, a conventional job and a promise to my wife that no more dying would occur stops me! Oh well, blondes do have more fun! It looks so good Kaylah! I love it. that's not annoying at all! hahaha but i adore this color!!! It's so beautiful! 🙂 I think it works so well because there's still a faint blue tint to the upper layer, and the bottom layer is so bright! You make me miss my colored hair so bad, haha. It's gorgeous! I love it. I love all the colors you do. Yesss! That's an awesome compliment! I LOVE this color! Its gorgeous and it makes your skin glow! gorgeous color and your hair looks so healthy! You are the second person that I've seen that can pull off green. Jess from Jingleheartart on Youtube is the other person. Oh wow, that is AMAZING! 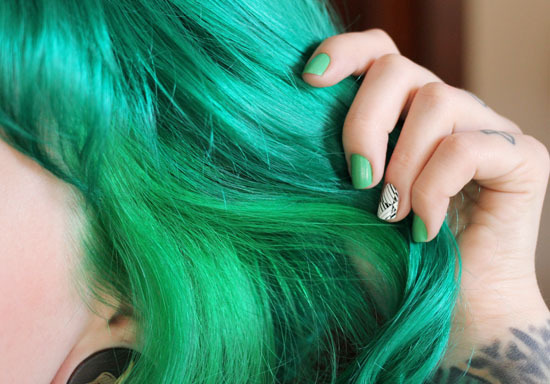 Green shades often don't turn out so great but that is the nicest shade of hair I think I've ever seen! I LOVE IT! I was concerned when I read that you whipped up a new color that perhaps you were going to do brown or blonde or something natural (nothing against natural colored hair, but you pull of color so wonderfully!). But this color takes the cake! Awesome! Stunning! It's so bright and beautifully shiny ^_^ Gorgeous! Gorgeous on you! Also, I never noticed that tattoo on your left arm before (with the deer) – it's so pretty! I agree with QueenieDot, my favorite thus far! totes awesome..
How do you keep your hair so thick, gorgeous, and shiny after treating it so often!? This looks so gorgeous! I love it! That is one amazing shade! Oh goodness, your hair is the most amazing thing I have every seen! I love this color on you! my favorite so far! I am so in love with that color! It looks amazing on you! Oh man this looks lovely on you! Such a great colour! It looks fabulous dear! Wow, these colors are beautiful!! I am always very worried about how I'll look in certain colors so I don't stray far from reds, purples, and pinks but this makes me want to venture out for sure! This color is BEAUTIFUL!! How do you style your bangs? They always look incredible! I just use a curling iron. This color is SO beautiful! It looks great! This is the prettiest color yet! Really suits you. That's an amazing color combo! Your eyes looks so bright and sparkly! I adore this color! It's completely gorgeous, and completely "you". Ooooh this is GORGEOUS! You look like a mermaid! that colour is just amazing, now you're a bush oh yeah! I think this color looks the best with your curls. I love your hair curly, but this really brings it out in a dainty and beautiful way. This shade of green is seriously perfect… I cant believe how vibrant all of your colors are! Ha! Yeah, nobody wants "holiday hair hue". I think this is my favorite color of all of the colors that you've done. to me this is the prettiest color ever! you look really beautyfull! That colour is beyond beautiful! Your hair is gorgeous! The colours are beyond beautiful, your hair is gorgeous! Green suits you so well! I love the colour of the top layer especially! Love it! You're so beautiful! You look amazing! I am completely in love with this color and I think it looks even better on you than the purple. I would love to color my hair this color but fear it would take forever to bleach my hair. I am however, excited to try punky color for the first time in flame. I just ordered it. I'm hoping it will help enhance my coppery color hair. Wish me luck! I think I just found my new favorite blog! LOVE YOU! I think it suites you so, so beautifully! You look incredible! This is my favorite hair color on you. Absolutely stunning. I think we had the same idea! But your color is definitely better than mine! 😛 I'll try to improve it! Ahah! Amazing color, your look pretty!! That colour is absolutely perfect. So lovely! The Grape Jamboree?!! I really hope it's as awesome in real life as it is in my head. Oooohh this is my favorite color on you! You look so amazing, if I could look like you for only just a few minutes!!! Jeeezzzz!!!! Love your shirt too and your tattoo is gorgeous. So. That's enough crazy compliments for today! Oh my gosh! I love your hair. Very pretty color. Love this shade of green! Good mix! That color has got to be the prettiest I've ever seen. I love the contrast! gosh that's an awesome color!!!! These are beautiful colors! It looks amazing against you skin and I bet your eyes really POP too! LOVE IT! I'm from Ireland and I died my hair green just before St. Patrick's day (not really thinking about it, I just wanted my hair green) and as I walked down the street I'd have people shouting at me and everything! I will never do it again around that time! Silly peoples! It would be the last thing I'd say to someone with coloured hair! Yours is perfect! I made the mistake of dying my hair black so I'm hoping to get it bleached out which will be hard going. I'll be sure to go through your FAQ cos I know you have a few blogs about hair colour! woo! LOVE the apple green underneath! I think this is my favourite hair colour on you!! So pretty! Amazing colour… Perfect on you! I always hear and read that green is the worst color to wear, because it doesn't suit with the color of the face..
And this color makes your face so full of light ! it really suits you and I love the fact your hair seem always so healthy ! one day, I will try this sheep placenta creme..
well, very nice color and it's always a pleasure to come on your blog ! have a shiny day ! yep it's official…you rock every colour! 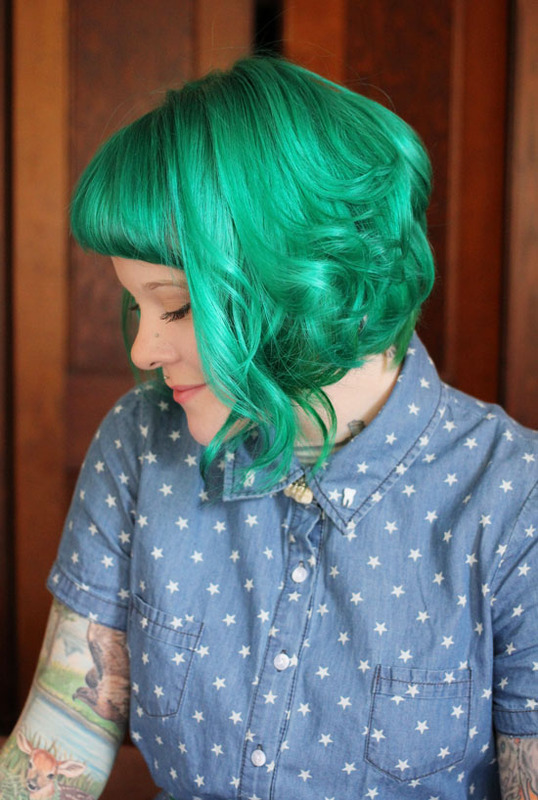 I love this color on you and if I ever get to dying my hair, this is going to be first. 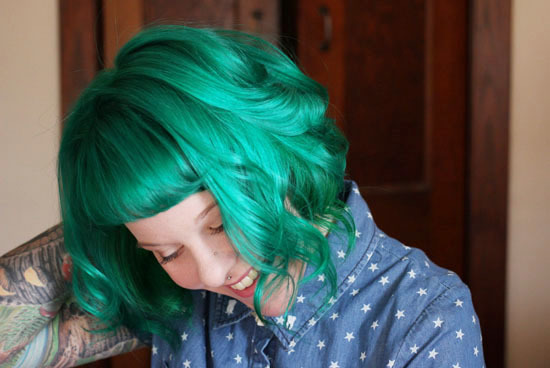 I have always loved green hair. I LOOOOOOOOOOOVE this hair color! Your hair looks so cool!! What a gorgeous shade! I love how you change up your hair so often and look amazing in every color. I love this! Awww i love it so much! your shorter hair looks so awesome and pretty too. That color is just so perfect! I wish that I had the courage to dye my hair such a bright and wonderful color! 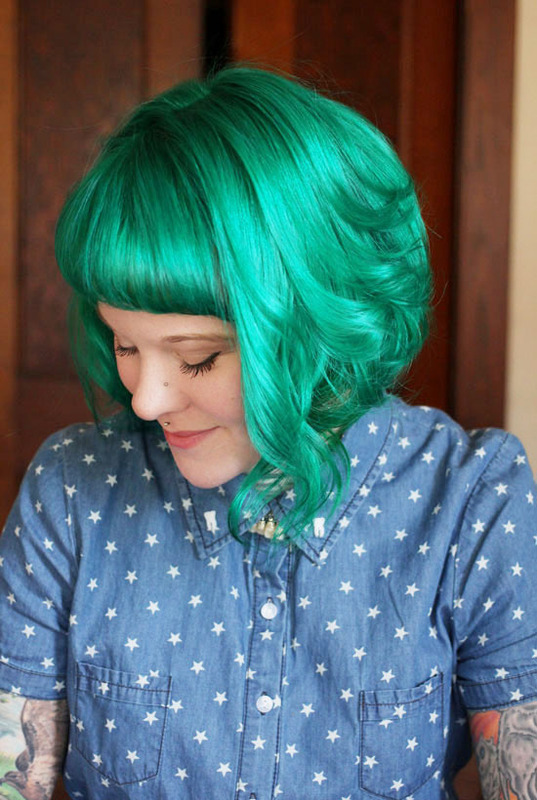 The color is so fabulously fantastic, but the cut of your hair really makes it. For some reason the green highlights how great that cut is! Your hair's just great! Can I ask what brand do you use for your hair dye? ?